Quiet location, balcony, garage, tastefully modernised. We would like to invite you to spend a few happy days in our newly renovated and equipped holiday home in the picturesque old town district of Bernkastel-Kues. The furnishings and equipment are modern and comfortable, and you can relax and enjoy life in beautiful surroundings. Garage, small but enough space for a car up to the size of a SUV. Shower over bath. Towels provided. Beautiful new wood stove for heating (wood briquets supplied), plus electric heaters. 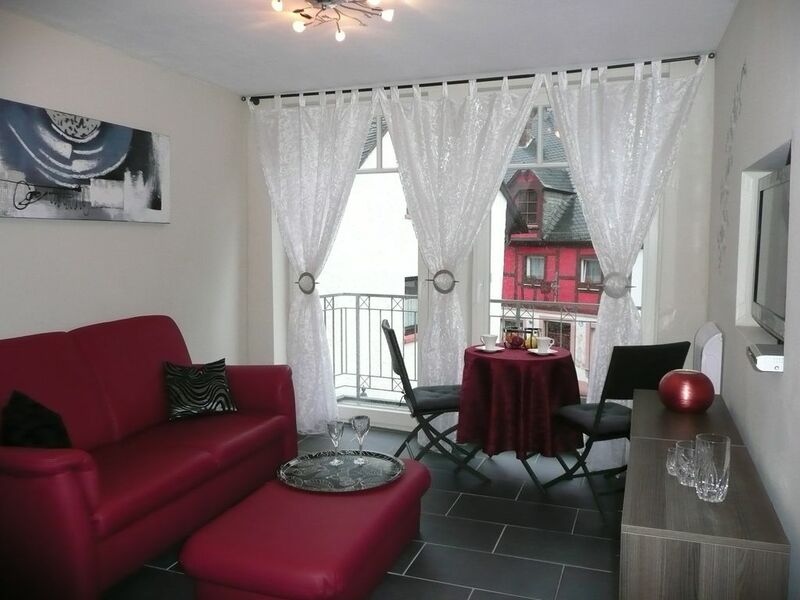 Apartment in Bernkastel is excellent and with very friendly neighbours and lovely views over the vineyards. You can sit on the balcony and watch the red deer eating the grapes. Their are plenty of restaurants to choose from, all within walking distance and all were very good. I have rated the accommodation 4 stars and not 5 stars as we were their for two weeks and had no change of bed linen ,and though their were plenty of hand towels to cover this period we had only two bath towels between us. I would certainly recommend this apartment and its location to anyone but for stays of more than a week the bed linen certainly needs sorting out. Sauber, zentral, gemütlich, komplett und einfach besser geht's nicht..... Wie würden sofort wieder buchen. Wir haben uns in dem kleinen Häuschen sehr wohl gefühlt. Es fehlte wirklich an nichts. Das Haus ist genauso ausgestattet, wie man es von der Beschreibung her erwartet hat. I couldn't recommend our stay in Bernkastel more. The house was charming, well appointed and immaculate. The food, wine and people in Bernkastel were the absolute best. I'd happily repeat this vacation anytime. Es ist wirklich alles da, was zu einem guten Haushalt gehört, wir haben nicht's vermisst ! Die Matratzen sind prima. Gerne kommen wir wieder einmal ! Our house is located in the picturesque old town of Bernkastel-Kues. The location is very quiet, since tho old town is restricted for car traffic, but all amenities are within easy walking distance. You will find excellent restaurants, quaint wine bars, cafés and shops, inviting you to browse and indulge in life's little luxuries. On the Mosel river there are pleasure boats offering river trips, and there is excellent cycling and walking through vineyards and along the river. Benrkastel is ideally situated to explore the many tourist attractions along the Mosel valley, and exciting cities like the ancient Roman town of Trier or Luxemburg are within easy reach.